Armchair birding at its best! Each species is given a page of text that summarises all you need to know about it - in an informative and witty style, plus a small but clear distribution map and a full-page photograph. It even has a ticklist at the end, in true birder fashion. So far, I've seen 13 of the 100 - realistically, I might see another 10 of them, unless I want to spend a LOT of money on air travel. I can't remember the last time I actually felt sad after finishing a book... but I REALLY didn't want this one to end! Fortunately, the author has written a few other books, which I will look for ASAP. This is a must read for any animal lover. Beautifully illustrated and informative, it is also incredibly entertaining! These 100 birds are amazing for varied reasons: some are beautiful, some have odd habits, some are common and some are heartbreakingly close to extinction. But every single one has a story, and the author tells those stories in ways that capture both the imagination AND the heart. I'm lucky enough to be able to read when I'm a passenger in a car. This book got me to and from 50 trips to the gym when my husband was driving-- so I learned about one bird per trip. 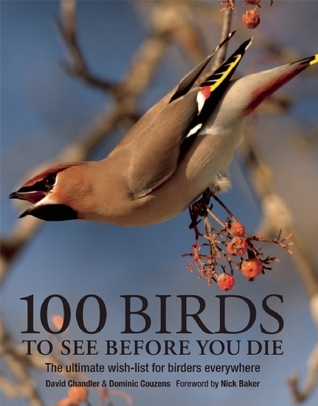 Excellent photos, lively writing, essential info ... mainly about birds I had never heard of who live in faraway places grin from where I've eve lived. I learned so many new terms for habitats that I'll need to re-read this one day and make my own bucket list of '100 habitats to visit." Fascinating one page of info about each bird including their conservation status and a page for a large photo. I have only seen 4 of the 100 birds- #94 Magnificient Frigatebird, #91 Roseate Spoonbill, #70 Greater Roadrunner, #47 Snowy Owl. This was a fascinating book, great for anyone interested in birds. Glorious photos were matched with interesting (and weird) facts about the different birds. It was not dry or boring, but generally witty, and occasionally irreverant! What a lovely, lively, and informative book! I certainly learned a lot, and the photos are incredible.